K-State recently has been recognized as an Extreme Science and Engineering Discovery Environment, or XSEDE, level 3 service provider, one of only 10 in the U.S. This honor formally aligns K-State's local supercomputing efforts, spearheaded by Beocat, with the network of national-level supercomputers through XSEDE. Service providers are independently funded projects or organizations that provide cyberinfrastructure services to the science and engineering community. In the U.S. academic community, there is a rich diversity of service providers, spanning centers that are funded by National Science Foundation to operate large-scale resources for the national research community to universities that provide resources and services to their local researchers. Extreme Science and Engineering Discovery Environment is intended to facilitate this ecosystem of service providers, thereby advancing the science and engineering researchers who rely on these cyberinfrastructure services. The K-State research computing cluster Beocat is currently one of the largest academic research clusters in Kansas. 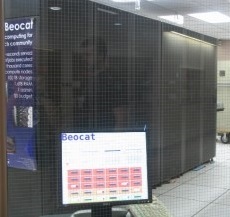 Beocat has grown to approximately 3 PB of total storage and 3500 processor cores on machines ranging from 24-core Xeons with 128 GB RAM to six 80-core Xeons with 1TB RAM connected by 40 Gbps QDR Infiniband. Use of Beocat is free for professors and students in the state of Kansas. In addition to many users across the K-State campus, Beocat also is a resource for users from Washburn University, Bethany College, Pittsburg State University, the University of Kansas and other institutions. Beocat is supported by National Science Foundation, National Institutes of Health, Department of Energy and university grants. For more information contact Daniel Andresen, director of the institute for computational research in engineering and science, dan@k-state.edu or at 785-532-7914.